If you don’t find your question (or answer) here, drop the Festival a line at info@svmusicfestival.org. You don’t! All concerts are free. Donors at the $2,500 level and up can reserve Pavilion seats in advance. However, there are also seats available in the Pavilion for every concert on a first-come, first-served basis. The line forms at the East Entrance. The lawn is always free and first come, first served. The only exception for all of this is the annual Gala, for which tickets are available online. Can I sit in the Pavilion even if I am not a donor? Of course. On any given night, from 700 to 1,200 seats in the Pavilion are available on a first come, first served basis. The line forms at the East Entrance, and there are chairs, shade, and a bar to make the wait comfortable. When does the Pavilion open? When should I arrive? The Pavilion opens at 5:30 PM, one hour prior to the performance. If you have reserved seats, please be in them by 6:15 as the Festival releases these seats at that time. If you wish to line up for first come, first served seats, it’s hard to predict when to arrive—some patrons will line up quite early if they really want to get a seat. There is usually a bit of a line by 4:30-5:00 PM. Please contact an usher (quietly) and they will help you find a seat during a suitable break in the performance. If you have reserved a seat, and it has been filled by someone else after the 6:15 PM deadline, our volunteer ushers will do their very best to find you seats as close as possible to your reserved seats. How long is the concert? Is there an intermission? Most concerts are between 50 and 75 minutes, without intermission. Anything longer than that will be noted in the program book. This summer, the August 22 concert (Mahler’s Symphony No. 2) will last about 90 minutes, concluding by 8:00pm. How do I learn about the music? Check out the program book and the Pre-Concert Chat. Jon Kochavi, Chair of the Music Department at Swarthmore College, writes notes for every concert in the program book. And, each evening before a performance, at 5:45 PM, the Festival offers a Pre-Concert Chat. You may attend in person by the Paver Bar on the lawn, or listen in on your mobile phone—see the Festival’s home page for the link. Can I bring my kids? My dog? Of course! 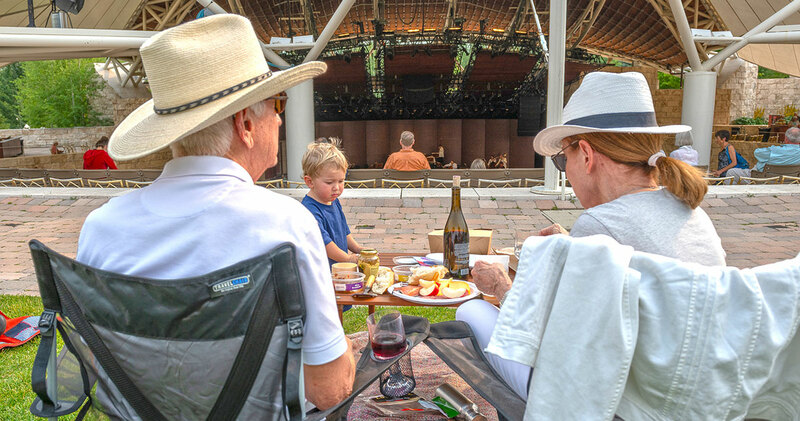 Families with kids of all ages are welcome to sit in the Pavilion for the Family Concert. “Regular” concerts are most appropriate for children 10 and over. However, it’s up to you. And, consider the Kids’ Music Tent at the back of the lawn, where local music educator Lisa Pettit entertains and teaches children ages 4-8 about music. Reservations are required: info@svmusicfestival.org or 208.622.5607. As for dogs, they are most welcome on the lawn. If your pooches are on the active side, please consider sitting along the perimeter or at the back of the lawn. Only credentialed, assistance dogs are allowed in the Pavilion. Can I bring drinks and/or food? You are most welcome and encouraged to bring food and drink to the lawn. Inside the Pavilion, drinks and light snacks are available at the Resort-operated bars on the East and West Terraces, and you are welcome to bring these to your seat. Can I record or take pictures and video of the concert? No recording (video or audio) or photography is permitted during the performance. Feel free to snap some shots before or after. Please dress however you would like. Pavilion guests seem to gravitate toward “Sun Valley Casual” and usually bring a wrap or jacket in case it gets a bit chilly toward the end of the concert. This is a hard one. Back in the old days, meaning the 18th and 19th centuries, audiences would talk, yell, and throw things during classical music concerts. In the 20th century, the pendulum swung the other way, with mean looks directed at anyone who so much as attempted a single clap between movements. In most cases, the composer’s intent was that the pause between movements is a time of reflection and silence as the transition to the next thing. Generally, it’s great to hold applause until the end of the piece, but if something particularly rousing moves you to clap, your neighbors probably won’t mind. Do you mind if I take a phone call? How does the sound work on the lawn? The Sun Valley Music Festival installs a LARES sound system every summer on the lawn. A LARES system uses microprocessors and complex processing equipment to create a natural-sounding acoustic. The Festival hangs numerous microphones over the stage to pick up the sounds of all of the instruments and then sends the signals out to the network of speakers on the lawn. The purpose is not to amplify, but rather to create an acoustic on the lawn, with the sound of different instruments coming from different places, as you would hear if you were sitting inside the Pavilion. How does the big screen work? The Screen on the Pavilion lawn is a 14×25-foot LED wall with imagery supplied by seven cameras inside the Sun Valley Pavilion. The Festival’s 8-member video production team includes camera operators, technical director, cue caller, and screen engineer–plus all the camera equipment. When was the Pavilion built? What is its history? The Pavilion opened on August 3, 2008. The idea started with Earl Holding, owner of the Sun Valley Resort, in 2006. At that time, the Sun Valley Summer Symphony (previous name of the Sun Valley Music Festival) held its concert series under a tent on the lawn. The design for the Pavilion was inspired by its natural setting: the roofline mirrors the mountains and sky and is supported by a huge main truss, supporting a permanent copper header and steel cable net. A seasonal luminous tensile membrane (“the tent”) covers 1,564 seats, the stage, and support facilities. The surrounding landscape is sculpted into an undulating park gently elevated into a natural amphitheater, with views of Trail Creek Canyon, Dollar Mountain, and Bald Mountain. Fun fact: the Pavilion contains over 1,000 tons of Mariotti travertine, from the Bagni di Tivoli quarry just east of Rome. Other structures featuring this travertine include the Roman Colosseum and the J. Paul Getty Museum in Los Angeles. How many musicians are in the orchestra? It varies by concert and by piece within the concert. On the whole, the Festival brings about 110 musicians to Sun Valley each summer. On any given piece, there might be 60-100 on stage, depending on the composer’s instructions. For a chamber concert, there might be as few as 3 or 4. For a big symphony with a chorus, over 250 musicians will fill the stage! Absolutely. The Festival hires many of the finest professional musicians in the world, pays them for each rehearsal and concert, and reimburses them for travel and housing costs. Thanks to amazing Housing Hosts, who welcome musicians into their homes, the Festival is able to minimize housing costs in order to bring these fine musicians here year after year. How can I reserve seats for a concert? Become a donor! To keep the concerts and education programs free, donors contribute over $2 million each year. One of the benefits of giving $2,500 or more is the ability to reserve seats in advance in the Pavilion. What do y’all do the rest of the year? Sleep! For about a week, anyway. After the summer season, the musicians head home to other work. Most are members of an orchestra in their home town. Some teach, others freelance. Alasdair Neale divides his time between his roles as Music Director of the New Haven Symphony Orchestra and the Marin Symphony while staying in weekly contact with the staff here. The staff, which swells considerably during the summer, shrinks back to a full-time complement of about 10 people. They go to work on the “business” of running the nonprofit, ramp up the education programs that run during the school year, and get busy planning the next concert series. The Festival could not operate without its amazing volunteers! Contact the office to find out about many different ways you can get involved, from helping at concerts to working in the office to assisting with education events.